Marie B. Liegel age 93 of Plain passed away unexpectedly at home on Tuesday, August 28, 2018. She was born on November 3, 1924 in Plain the daughter of Frank and Frances (Bayer) Brechtl. She was married on February 12, 1945 to Michael J. Liegel. Marie is survived by a daughter, Peggy Liegel, 2 sons, Gilbert and Konrad (Karen) Liegel, 6 grandchildren, 6 great grandchildren, a brother, Victor (Marianne) Brechtl, a sister, Imelda Nachreiner, nieces, nephews, other relatives and friends. She was preceded in death by her parents, Frank and Frances Brechtl, her husband, Michael Liegel, a daughter, Karen Liegel at the age of 3, 2 sons, Michael and Franklyn Liegel, 2 brothers, Herbert and Lawrence Brechtl, 3 sisters, Alma Alt Ruhland, Irene Schweiss and Florence Hellenbrand. Marie loved housework and taking care of children. She enjoyed playing cards, sewing and was proud of her post high school education later in life at MATC. 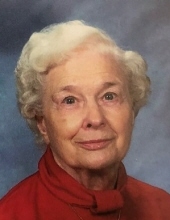 She was a member of the Plain American Legion Auxiliary, a lifelong member of St. Luke’s Catholic Church, a woman of strong Christian faith, proud of her years teaching religious education and being a leader of prayers. A Mass of Christian Burial will be held on Thursday, September 6, 2018 at 11:00 A.M. at St. Luke’s Catholic Church in Plain. Fr. John Silva will officiate with burial in the church cemetery. Visitation will be held on Thursday at the church from 10:00 A.M. until the time of Mass at 11:00 A.M. Memorials may be made to St. Luke’s Catholic Church. Online condolences available at www.staffordfuneralhomes.com. The Richardson-Stafford Funeral Home in Spring Green is assisting the family with the arrangements. "Email Address" would like to share the life celebration of Marie B. Liegel. Click on the "link" to go to share a favorite memory or leave a condolence message for the family.